In studying interpersonal combat, there are many facets of the whole picture. Some considerations are too often overlooked or misunderstood. As an example, heft, feel and handfit mean more in a concealed carry handgun than in a holstered service pistol. Speed into action is important. With this class of handgun, shooter-gun interface is important above all. If you can shoot, there is little that can be accomplished tactically with one quality handgun that cannot be accomplished with the other. One of the important aspects of close-quarters combat for which we must prepare is grappling for the handgun. The retention position was developed for use in intimate-range combat; it should be learned and practiced often. But there is always a possibility of an assailant interfering with the draw before you are able to assume the retention position. The endless possibilities intrinsic to such battles require reapplication of the learning process. As we study the problem, absolute perseverance must figure prominently in the process. Some individuals are too passive to organize for defense, though this defies logic and normal models of motivation. The individuals who do choose to organize must make sound calculations; there is a reason we are armed. When the object of your fear becomes the subject of your fear, you best have a counterattack planned that you are able to smoothly execute. 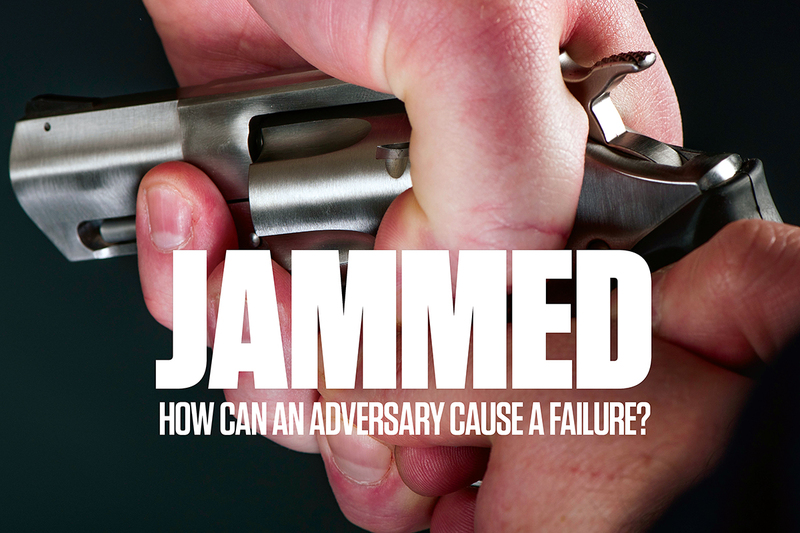 An important question is seldom asked: What does it take for an opponent to jam my gun? In this context, we do not mean a firing jam or malfunction but knocking the gun out of battery or causing it not to fire when it is needed. Shooter error might be just as deadly. What tactics can be used to counter such actions by an adversary who might attack on the draw, after the gun is drawn or when we are firing? The gun might even be jammed by the user through poor planning. The other manner in which the handgun might be rendered inoperable comes when we do not have a good grasp on the handgun or when we allow it to become tangled in our garments. These circumstances are common during deadly force encounters. In another instance from my files, a self-loader suffered the slide lock forced into the receiver by a tight-fitting holster. This flawed pistol, now long out of service, fired once and jammed. The officer in question was stabbed as a result of a single 9mm hit that did not take immediate effect. This handgun went through several generations of modification and has now left the scene. To evaluate the likelihood of an assailant being able to jam our handgun out of action, I collected a sample of likely firearms. (While procedure and combat tactics are more important than the weapon, I felt the test valid for our purposes.) In every test, the procedure was conducted by experienced gun handlers and professionals. Some of them have seen people shot and were not likely to risk being shot during training; every safety precaution was followed. By the same token, it was an artificial environment. We were not going to break expensive firearms, but we gave it our best effort at determining what might happen and how you might avoid the problems. These firearms included the Glock 19, Glock 23, Colt Government Model Rail Gun, Colt Combat Elite, Beretta 92 and SIG P220 Carry self-loaders. We also used the Smith & Wesson Model 28 .357 Magnum and Smith & Wesson Model 442 .38 Special revolvers. Will the pistol go out of battery when being holstered in a tightly fitted custom holster? The 1911 is cocked and locked. It cannot go out of battery on holstering. The Glock is pretty tight. Normal holstering did not produce an out-of-battery experience. The SIG’s wide slide occasionally slips, but when drawn, snaps back smartly. The Beretta was pressed out of battery and required a nudge with the thumb on occasion to reset. To cure this problem, guide the pistol into the holster properly and do not haphazardly holster. Keep the finger on the back of the slide or on the hammer to prevent the pistol from going out of battery. With hammer-fired pistols, this also provides a warning if the trigger is engaged during holstering. If your adversary presses the slide toward you, will the disconnect be activated? We carefully triple-checked the handguns to be certain they were unloaded. I had a tester stand with the handgun in a firing grip. A tester tried to grasp the slide and move it out of battery, from the side, preventing the handgun from firing as the handgun was held in a firm grip. Can the pistol be forced out of battery easily? With the 1911, not if the safety is on. With the safety off, yes, the disconnect will activate. The Glock disconnect also activates, but the Glock seems to have the most leeway in pressing the slide to the rear before the disconnect is activated. The SIG slide is tight and is the most difficult to press to the rear. The Beretta’s wide slide allowed the adversary to press it to the rear rather quickly. To counter this attack, if an adversary grabs your pistol, push the pistol forward forcefully toward him or her and then rip the gun back. If you have a sharp front sight, it may help. With the 1911 without a full-length guide rod, if the bottom of the slide connects with the barricade, the slide will move out of battery. With the 1911 with a full-length guide rod, the slide will not be pressed to the rear. The Glock isn’t likely to be pressed out of battery if you bang the barricade. Neither the SIG nor Beretta were susceptible to this type of malfunction. In this test, we fired a Walther PPK, Glock 42 and Smith & Wesson Model 442 handguns from inside of a jacket pocket. The self-loaders fired once and jammed, failing to feed. The slide on each hit the rear of the jacket pocket. The .38 revolver fired all five shots. Though the jacket pocket was blown to tatters, the revolver really shines in this application. A caution: I did not realize how much heat is generated when the revolver is discharged. I was not burned — not even singed — but I really felt the heat in the jacket pocket. A .357 Magnum snub-nose revolver might set a hairy knuckle on fire! Interfering with the draw is possible and even likely at close range, so preserving the element of surprise is vital. The assailant should not know that you are armed until the gun is drawn. If the action is at intimate range, such as the adversary pressing a knife attack, the counter to interference with the draw is to blade the body to the assailant with the non-dominant side fielding or shielding attack while the strong-side hand draws the weapon and engages the threat. After the threat has managed to interfere with the draw or has his hands on the gun, the problem is severe. The push and pull described earlier is the most commonly taught and effective tactic. The handgun can be pushed out of battery, which will prevent shooting the assailant. The previous test confirmed it can happen. I recommend carrying a quality and immediately accessible folding knife (Editor’s note: Fixed blades are much better than folding knives in this situation, as Clay has demonstrated) as an aid to retention if the assailant has his hands on the holstered weapon. The concealed carry permit holder has many disciplines to study, and retention of the firearm is among the most important. The subtlety and philosophy should be understood, and retention drills practiced. To do otherwise is to be half-armed. Also the slide disconnect will likely engage on “Contact Shooting”. For S&W M&P if the slide moves back, even slightly, the disconnect will engage. And the gun will not fire. Contact Shooting – your gun is pressed against the body of the threat. Spitting in the attackers face has given me the opportunity to assist in the decomposition of aforementioned \”bad guy\”. Spitting in the attackers face has given me the opportunity to assist in the decomposition of aforementioned “bad guy”. The Glock’s “leeway” in allowing more slide movement before the disconnector engages also means it is more prone to fire out of battery. That might have something to do with the kBoom! phenomenon they’re known for. Adversary? Does it Jam every year?